Books Anonymous: What are books? Funny kind of question, isn't it? But, how many times do you find yourself having one of those odd detached moments of looking at an item that you know well - an ordinary, everyday item - and seeing it suddenly with quite new eyes? I do this at odd moments - it can be quite random. I think, at some deep level, it's part of processing all the 'stuff' around me. Dearly Beloved and I go and look at houses for sale. We're not about to purchase anything at the moment, it's more about giving ourselves something to aim for, an incentive to keep plugging away at our various endeavours. We have quite similar tastes in many things - but quite different ideas, often, about the amount of space we need. There's a book I must heave out of storage - there's a particular box in storage that was never meant to go there at all...and it's in that box. It's complex, so I'll leave the analysis for now, but there's a component in it about the excess space we have created for ourselves in the homes we build nowadays and the stuff we pack into that space rather than the space we need to have that is sufficient to shelter us. It's come back to haunt me due to seeing so many very large houses lately, and that's lead to this particular train of thought. A friend of mine is writing a blog that looks at the footprint her family is leaving behind them - you can check it out here - and that's another part of my thinking. There's also the downsizing we've had to do in this recent move, and the editing of possessions. It comes down to a basic question, for me, that goes something along the lines of, "What is all this stuff, and do I really need it?" - and if the question becomes part of a general discussion, inevitably, my books come into it. It's not unreasonable, on a physical level. As all of you know, moving books is a right pain. They're heavy. You can never put as many as you think will fit into a box that can still be picked up when it's full. So, a large collection can mean an inordinate number of boxes. Then there's where to put the bookcases - as I said to DB on the weekend when we were discussing one particular house (a smaller, really quirky one that I really fell in love with), I can find places for bookcases anywhere! I've had lots of practice, gypsy type that life has made of me... He laughed, and agreed with me. For me, it comes down to the books being something more than just heavy paper things to be carted from place to place. When I go into a house that's open for inspection and there are no books anywhere, there is an emptiness, regardless of how nice it might be, how well the spaces might work, or how well it's been decorated. Somehow, there is no soul in a house without books. I have moved house, on average, about every two years my whole life. I hate moving. There are only a handful of moves in that multitude of upheavals that have been of my choice. Most of them were force of circumstances, or the needs of other people. Consequently, the books have been packed and unpacked, stacked and re-stacked, arranged and rearranged more times than I care to think about. Once, and once only, I lived in a house with a room that became the library. It had a fireplace, I sourced a small vintage couch from a secondhand shop, my piano was on one wall, and the other walls were covered in books - right to the ceiling on one of them - there were even books on the mantlepiece. Everywhere else, the books have been fitted wherever I could manage to fit the growing collection of bookcases necessary to contain them. For years I carted around a collection of besser bricks (breeze blocks) and pine planks that got rejigged into various configurations, depending on the available space. DB is the only person who has ever packed and moved my books for me. As they grew, my kids helped - complaining loudly - in past moves. "Why can't you collect something light, like feathers???" The re-stacking has always been my job, because I have systems and patterns that I need to figure out so I can, once they're all in the bookcases, walk into the room with my eyes shut and put my hand on exactly the book I'm after without looking - and I really can do that! Why do we do this? Committed book junkies never question this mad activity, this massive extra load that is part of moving house. Of course the books go. All of them. Only rarely - as is the case at the moment for me - do we consign books to storage. Other things, certainly, but not the books. And, I miss the ones that aren't on the bookcases here. I feel their absence. 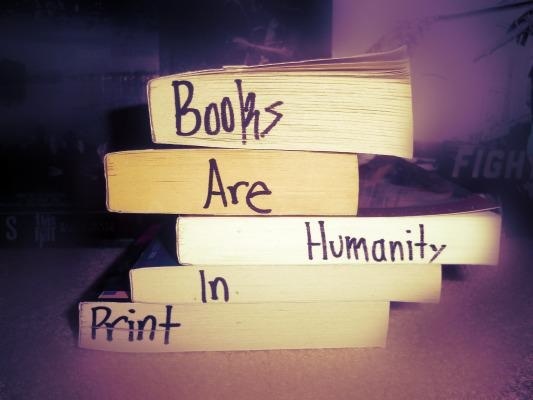 Books aren't just things. While they may be beautiful objects in their own right, they are treasures. They are worlds into which we can escape, visions we can borrow and inhabit for a while before we rejoin our normal routines. They are also memories; the books themselves carry bits of the people we've shared them with received them from, read them to... Everyone's book collection is almost like some weird fusion of a portrait and a self-portrait. You can gain a lot of insights about a person by looking at their books. Awesome post! When I first left home I bought a couple of really cheap chip board shelves, painted them a favourite colour, so my books had somewhere to live, meanwhile I sat on the floor and ate dinner sitting on a floor cushion with a plate in my lap. Those same shelves have been repainted bright colours and are now housing my daughter's books in her first place away from home. We have the same problem whenever we move, nothing is more lovingly packed then the books and their is nothing more frustrating than having a book you want packed away in storage. My first bookcases, when I left home, were besser bricks - painstakingly painted glossy yellow - and pine planking. They ran, just under windown height, around three walls of the living room of the semi I was living in at the time. The top shelf allowed me to prop a huge painting I did in high school that I've been careting around with me ever since - it too is currently in storage. Those bricks and planks stood me in very good stead through many years of moves. Apart from the weight of the bricks, they have to be amoung the easiest of bookcases to actually move!My current set are matching (for the first time in my life!) wood grain melamine particle board, very cheap - the shelves are sagging already - unlike the trusty pine planks, which lasted for years! When my kids were little, I wore a pendant that was a black enamelled rod with gold rings around the ends. When they asked what it was, I told them it was the only true magic, that with it, I could transfer my thoughts into another mind, make people keep their promises, and change peoples' moods with a few waves of that little black wand. After they oohed and ahhed, and the concept had taken hold, I pulled the bottom of it off, and of course, it was a pen. They've never forgotten the magic, but of course, the paper (of which books are made) is an equal partner in the sorcery... Nice work! Jack, that is the BEST story - I love it!